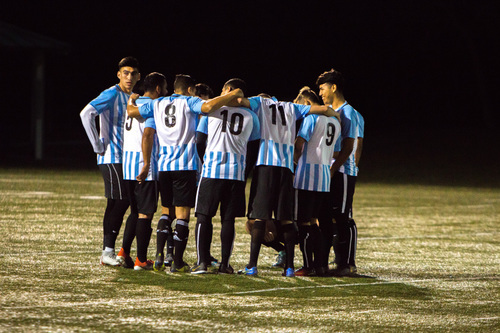 The 2019 Cal South Adult State Cup started with great fanfare in February and the excitement has continued to build throughout the tournament. As we reach the beginning of April, the teams remaining in the cup can almost reach out and touch the trophy as we enter the crucial semi-final stage. There are just four teams remaining from the sixteen which entered the event at the group stages and with just one match separating the teams from the final, the pressure is on. However, one team knows exactly what it takes to reach this stage of the competition and beyond, the defending champions, Chula Vista FC. Having been drawn in a group with Kern Country Mustangs FC, Rebels SC and Deportivo San Juan, it was always going to be difficult to progress, with some tough matches. Chula Vista FC opened with a 3-0 win over Rebels SC before suffering a disappointing defeat against Kern Country Mustangs FC. How you bounce back from a defeat is a sign of the mental strength of the team and Chula Vista FC responded in the best way possible, thanks to a stunning 6-0 victory over Deportivo San Juan. That result saw Chula Vista FC qualify for the quarter-final in second place and the team met Miran FC, who topped Group D with two wins and a draw. Coming up against an unbeaten team is never easy but Chula Vista FC showed their skill and experience to record a comfortable 3-0 win and progress to the semi-final. It was one of the most dominant results in the quarter-final, with only one team managing to record a bigger margin of victory and sees Chula Vista enter the last four full of confidence. The goals were scored by Ernesto Espinoza, Sergio Zamudio and Alejandro Lopez. Espinosa scored arguably the pick of the bunch following a fantastic run from inside his own half and a lovely dinked finish over the advancing goalkeeper. Chula Vista FC will meet Cali Gators FC in the semi-final of the 2019 Cal South Adult State Cup, who came through their quarter-final with a narrow 1-0 win over Lionside FC. They topped their group and will be determined knock-out the current cup holders to reach the final. Lionside FC reached the semi-final last season so Cali Gators FC have shown they can beat the top teams and Chula Vista will need to be at their best to succeed. In other news, Chula Vista FC U23 also known as ‘DOS’ have been enjoying themselves in the Men’s Amateur 1st Division, securing a place in the semi-final of the tournament before the final round of group games. The match will take place on the 27th April, two weeks after the Cal South Adult State Cup semi-final and on the same day as the final, so it could be a great week for the futbol club were Chula Vista FC to go all the way. It’s an exciting time to be both a fan and player at Chula Vista FC and April could be a special month in the history of the club.